It has been a while since I posted here at the AnnTheGran site. Earlier this year we have released a new version of Pre-Design Studio, named "Pre-Design Studio III". We have added many functions that make it even easier to quickly create your own artwork for embroidery digitizing software or for longarm quilt systems, or to send redwork/quilt patterns directly to your embroidery machine. One of those new functions in Pre-Design Studio III is the Magic Square. In just one step it will copy, paste and mirror a selection, then copy and paste both, flip those and put them under the original. The 4 together form a block. 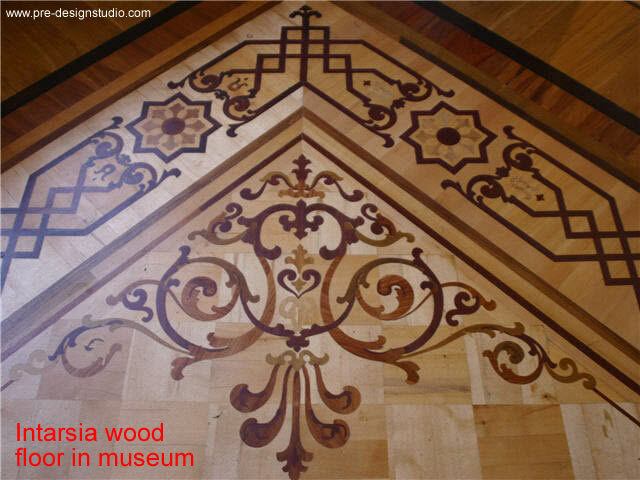 Let me show this on the basis of a photo of a wooden floor in a museum, opened via the Background menu in Pre-Design Studio III. Step 1 - Start Pre-Design Studio III and choose menu Background to open a background image. Take the Curve tool and trace the part that you want to use in your embroidery or quilt pattern. Click from point to point, right-click to finish. Step 2 - Edit the pattern: perfect the lines with the Select tool and move the points where needed (I only drew half of it, then copied, pasted and mirrored it). Rotate 45 degrees left, select it and click on the Magic Square button. Step 3 - Save the pattern to use as a quilt pattern. Then you can use it as a quilt pattern for your embroidery machine: choose menu File > Convert to Stitches. Save on a USB stick and insert into your embroidery machine. Fill the pattern with color (menu View > Color Filled), choose a color in the palette nd click in the design parts. Then choose menu File > Export Color Bitmap. Open the BMP in your embroidery digitizing software and let the AutoPunch / Autodigitizing part fill it with stitches. Sorry for this incredible late reply: we were traveling and after we got back I didn't check anymore. User Guide and tutorial videos are included with the Pre-Design Studio software. So no need to purchase those extra. You can download a trial. User Guide can be opened via menu Help > User Guide (in the trial too). Embroidery Advisor Presents: Autumn Toile Goodies What's a Tortilla Warmer?